Last year, one of my readers wrote to me regarding his great-grandfather Don Juan Riu of the Riu Hermanos store that operated in Manila since before the turn of the century. Tom Morato III was kind enough to provide much of the information about his family and their business as well as incredible photos of Manila’s past. 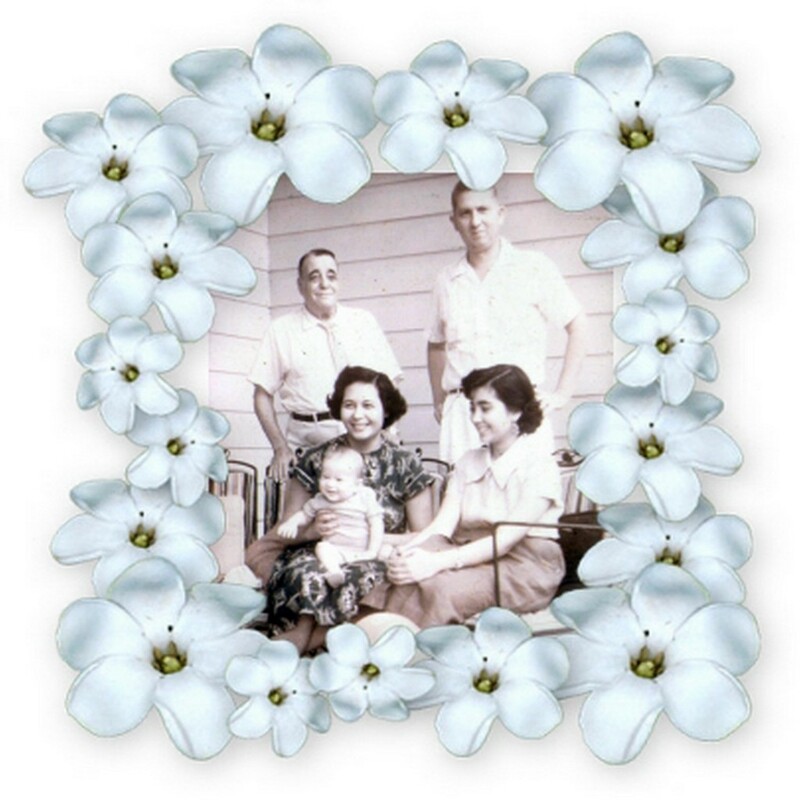 I have included excerpts of his family’s story within the article. The Philippines was still a colony of Spain when Joaquin Riu arrived in Manila in 1893. Perhaps he may have followed a relative, Don Esteve “Esteban” Riu i Plana who was the first Riu to settle in Manila and establish a maritime consignment firm in the late 1870s. (source: Paquito de la Cruz). 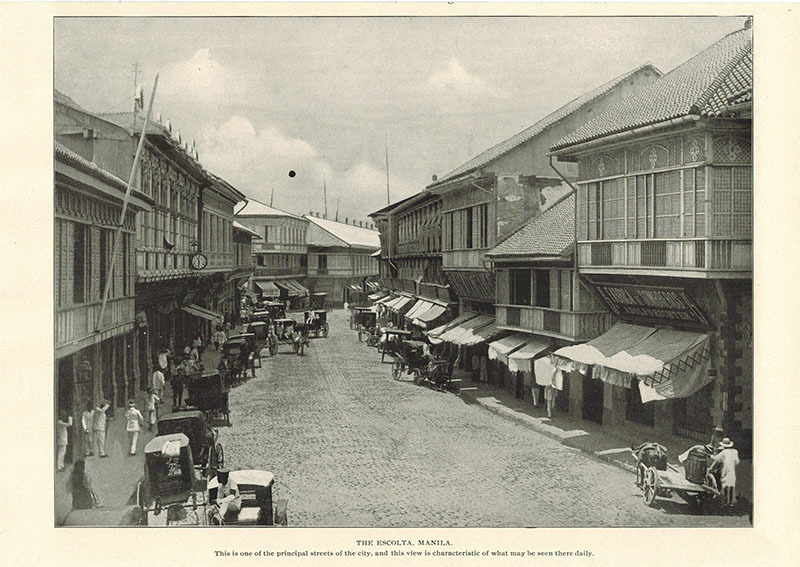 Escolta was not the purview of elite shopping then as it would be in the 1920s and 1930s. 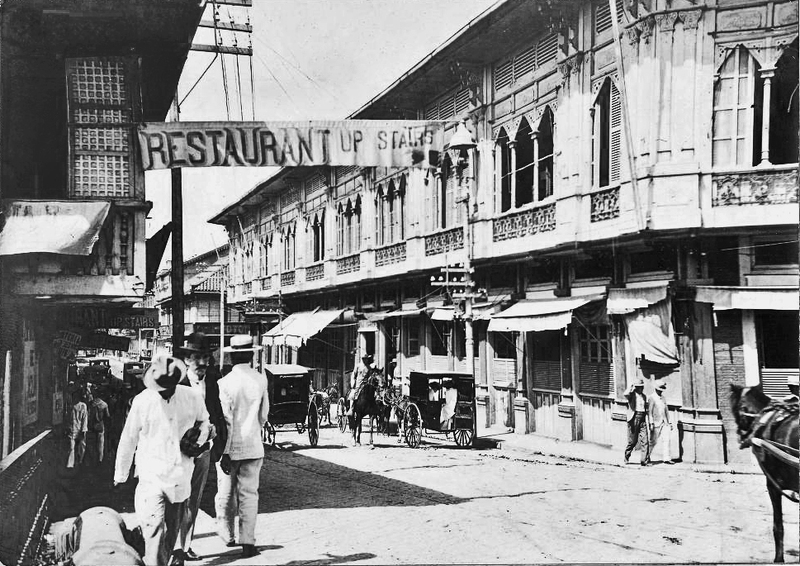 Small stores, protected from the sun and heat by large awnings, dominated the rather short and narrow street close to the Pasig. Its proximity to the river allowed goods and supplies to be offloaded directly onto the Muelle de la Industria that were carted off on carts pulled by carabaos to import/export and retail businesses just a short distance away in the Binondo and Santa Cruz districts. 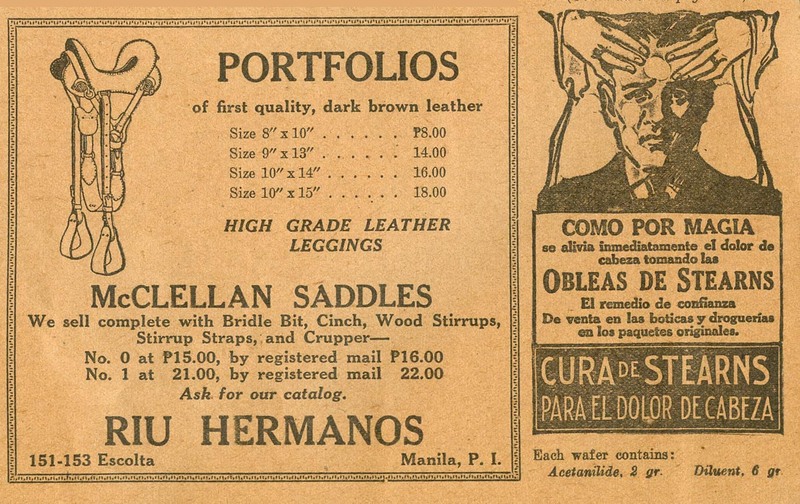 Realizing the potential as a supplier of high quality equestrian equipment and saddlery, Joaquin opened one of the city’s first department stores at 153-155 Escolta corner of Pasaje Perez (Calle David) in a building owned by Don Rafael Perez-Samanillo. Tragedy struck as the entire block of the former Samanillo building was razed during a fire on the night of September 21, 1922. It was apparently the work of an arsonist who rented a small room in the next building. 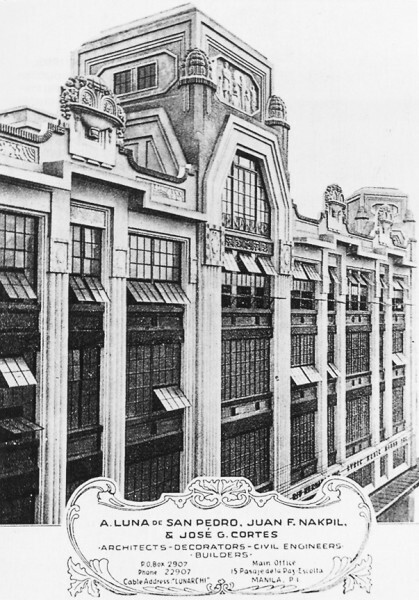 The entire block was torn down and the new Perez-Samanillo building designed by Andres Luna, Juan Nakpil and Jose Cortes, was completed in 1928. 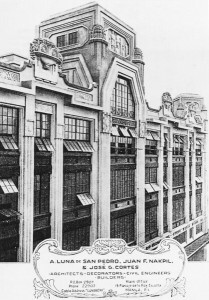 The store remained under the brothers’ management until 1937 when Joaquin and his French wife decided to leave the store to his brother and retire to Nice, France. Joaquin passed away in 1952. In the meantime, Juan met and married a local girl, Felisa de los Santos Cruz from Montalban, Rizal. Below is a photo of the couple taken in the mid-1930s. Juan Riu stands outside the new store in the Perez-Samanillo Building. 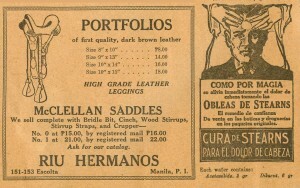 As the Polo fever hit the Philippines in the 1930s, the Riu Hermanos was the outfitter of many jockeys and horse owners from the Manila Jockey Club, the Manila Polo Club and Los Tamaraos Club as well as the horse teams from the U.S. Army. 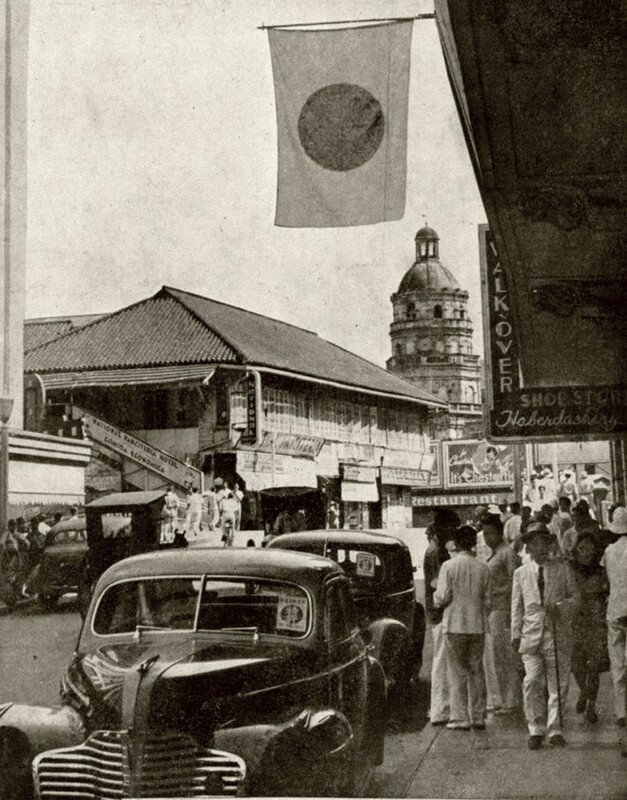 Unlike the Americans, who were interned during the Japanese occupation leaving their stores abandoned and shuttered during the Japanese occupation, Riu Hermanos continued its operations although I imagine that the importation of goods would have been quite restrictive. Below are photos from the pre-occupation era. 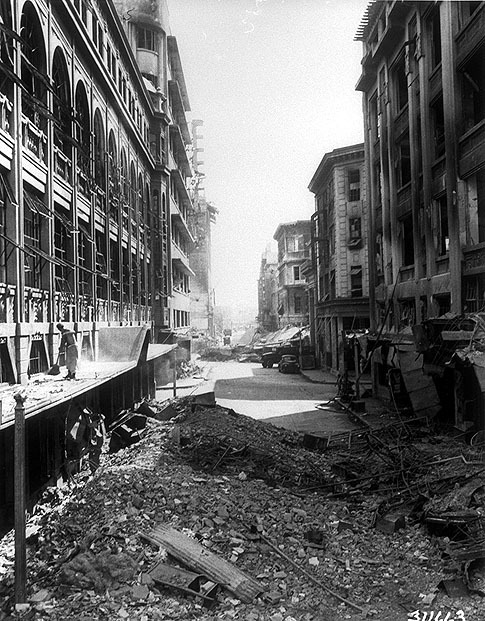 The Battle of Manila destroyed much of the Escolta and the downtown area. Reconstruction followed into the early Fifties. Other stores came in to take over the old location of Riu Hermanos such as Berg’s and Assandas. 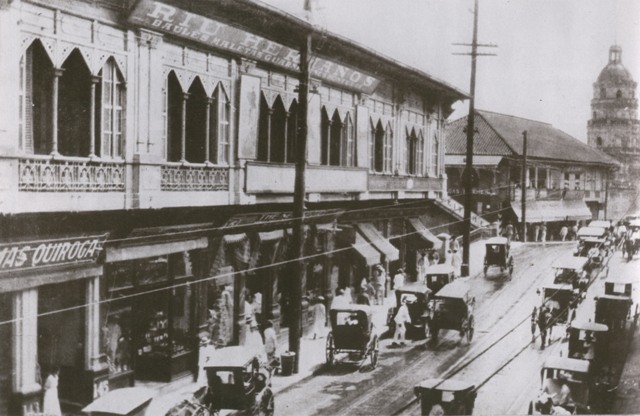 Finding a suitable location, the store was relocated to the De Guzman building on R.Hidalgo in Quiapo. In 1952, it moved again to the Cu Unjieng Building on T.Pinpin street. Another branch was opened in 1952 at Padre Faura street in the Ermita district. In 1966, the store and shop was transferred to Juan’s 1,500 square meter lot at his residence in Scout Gandia, Quezon City. In 1972 at the age of 94, Don Juan Riu, died in his sleep peacefully in his bedroom. His beloved store, Riu Hermanos died with him. My thanks and appreciation to Tom Morato III for this wonderful story of an important segment of Escolta’s history. Whoever says time travel is still an impossibility hasn’t been to Manila Nostalgia and gone through your blogs. Thanks, Lou. Truly love this. Thanks Rico. I’m glad you liked it. I always like reading your blog, Lou. I get to learn more about the history of our beloved city. Plus, history comes alive. More stories to come. Thanks Lou for giving us a peek of Nostalgia Manila. I was born in 1940 and it gives me the energy and interest to look back what was going on those times. Thanks to you. I strongly feel I belong to that era. Hola! I’m a 26-year-old Filipina who enjoys this blog. I love Philippine history. I’m actually studying Spanish and most of the photos here evidently show Spanish influences. Thanks for this blog! One of my earliest memory as a small boy, somewhere in Manila, we were crossing a big, busy street, my short pants dropped because my suspender [we kids used suspenders those days] suddenly snapped! While we were crossing that street, I was looking above ..at that neon lights…showing a huge coffee pot pouring coffee into cup. Does anyone know or remember seeing that? Lou, thanks..a big thanks for all of these. Funny story ! Yes, the Pura Coffee pot was on Taft close to the Metropolitan Theater. There’s a picture of it posted on my Facebook Manila Nostalgia site. That coffee must have been “Café Puro” (remember the brand?). I wonder if it’s still around. They used to have their factory at Pasong Tamo in the ’60s/70s. Sir.The plant is still operating.The smell of brewed coffee beans still smells in the area every time i passed by after work. Great blog, Lou. whatever you may have taken up in college, you are now a cultural historian of the philippines with your blogposts. Thanks Ike. Looks like I’ve found some purpose in my retirement years. I wonder if the heirs of Don Juan Rui would consider reviving the brand their grandfather started? I remember that Hermes started out in the same manner. Sr Riu must have been Catalan in origin? My jaw dropped of how Escolta look like before and after the war. I really love history even as a kid till now. I was looking for some history and images of our town in Kawit yet only Aguinaldo and some small city pictures I’ve seen. I was born early 70’s and glamorous look of manila has gone already what I see at that time late 70’s til 2000 was garbage, crooks, and many scavenger roaming around. My father said when we are going for a trip in avenida and escolta It was so beautiful when he was young and He was so dissapointed how it was neglected by our government for a long time. Too much commercialism rotten the place and the corruption that politician done who doesn’t care about our past. What’s in their head to put LRT in a stiff road of avenida? The place become so gloomy. Sí. En Joan Riu era Català, germà del meu avi, Jaume Riu, de Barcelona, del barri de Gràcia. Vam passar un dia inoblidable al Tibidabo amb la seva mare, l’any 1970.